This write-up is LONG overdue! Caught up with other writing assignments and, well, being human (probably half the time being a human doing). In any case, here’s my lengthy piece on the conference. I had to break up the posts into two parts. Here’s the first part of my reflections along with an introduction. Comments, constructive feedback, and/or challenging questions are more than welcome! Enjoy!! As a child, I constantly wondered, “Who am I?”. My father was 60 years old and my mother was 26 years old when I was born. Growing up, the retired military man was the stay-at-home parent. He constantly played his big band music on AM radio and, often times, strummed his guitar. His traditional and gender specific beliefs accompanied by strict rules were challenging to abide by. On the opposite end of the spectrum, my mother was progressive, young, vibrant, and provided all the essential talks (i.e., issues about sexuality, dating, friendships, etc.). My mother let me dress in button ups and men’s neckties and allowed me to play around with gender representation in my pre-pubescent and early teen years (she let me wear overalls and baggy jeans). Ironically, my father let me listen to rap music and the Mary Jane girls while my mother refused to buy me McDonald’s, made me read the dictionary, and listen to classical music. 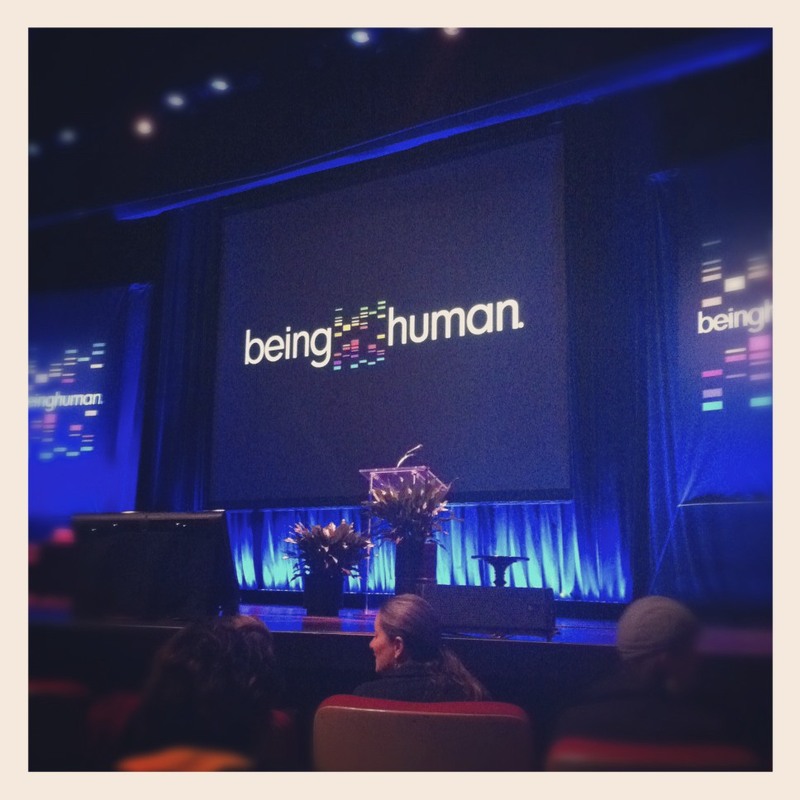 After attending the Being Human 2012 conference, my fascination with the human brain, mind, and body expanded and brought me back to these childhood memories. Naturally, I thought about the past few years and how much has happened! Now, if you weren’t at the conference and would like to view the full programming or a specific presentation, please visit the Being Human fora.tv channel by clicking here. Trust me, the talks were engaging, enriching, and are worth your time. Most importantly, you are more than welcome to return to this particular virtual space to take part in a dialogue with me, which I would LOVE! Everyday, we use our senses to tell us something about our environment. From feeling the temperature of a cold room that may lead to turning up the thermostat or perceiving colors in a book, our eyes and sense of touch certainly work in concert with our brain to help us navigate the familiar as well as the unfamiliar. 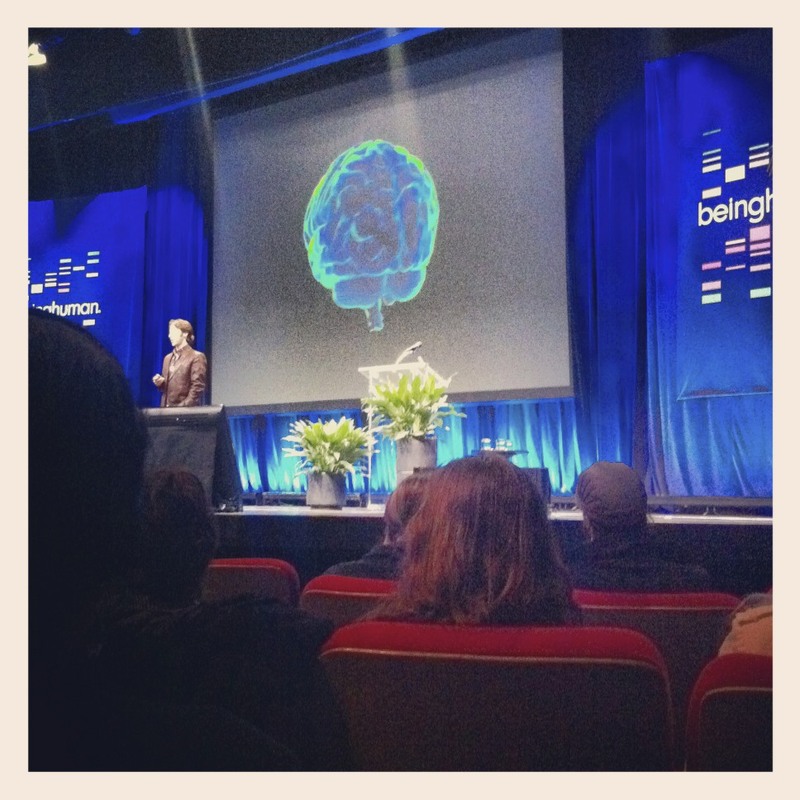 Neuroscientist and artist, Beau Lotto, started with an entertaining and participatory talk on perception. As a performance artist, he offered a fun look into how our brains perceive visual information and how our perceptions easily fall prey to illusions. Throughout his talk, he made clear that, “Context is everything”. Since our perceptions change due to context, he asserts, “All information IS meaningless”. When we get feedback from our experiences, we see the world through that particular experience, and the world changes. Now, here’s the throwback statement to my undergrad philosophy reading of Immanuel Kant, Lotto stated something along these lines, “…the brain finds relationships through engagement with the world and develops meaning”. Gestalt psychology came to mind as while listening to him speak but that’s an entirely different bag of neuropsychology goodies. Lotto also claimed, “the brain continually redefines reality and history of interactions”. Essentially, we get to select our delusion (or illusion) and, according to his definition, “The brain is a representation of its history”. It’s good to know that my long list of to-dos for the week is, well, pretty non-existent. Then again, it depends on how I perceive this list and what I do with the information, right? According to Lotto, my manager may see things differently! 😉 Visit Beau Lotto’s site here. Friendly Exchange on the Social Network ~ Yes, Sarah gave me full permission to use this image! 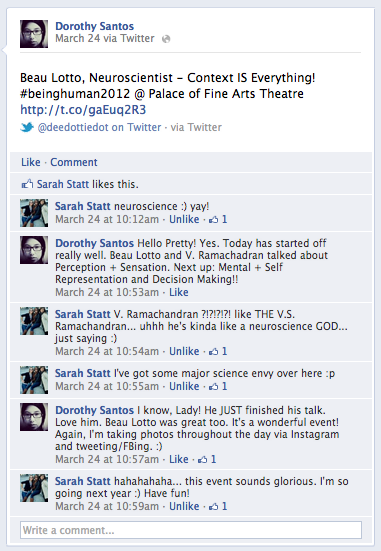 Soon after, popular neuroscientist, VS Ramachandran, shared thoughts on body and brain interactions. As you can see from the screen capture above, I was tweeting throughout the event. A scientist friend was equally engaged with Ramachandran’s work! For those of you not familiar with his work, he has done significant research on the “Phantom limb”. Through brain imaging and behavioral neurology, Ramachandran’s research points to the idea that the human brain has the full capacity to see itself as (physically) whole despite circumstance (i.e., being an amputee). Essentially, an amputee’s ability to physically feel, sense, and perceive their absent limb. Although an arm is not physically seen, the brain doesn’t know that the arm is gone. It continues to receive signals. Ramachandran compares this to a virtual reality system. Mirror Visual Feedback (MVF) Virtual Reality (Complex Regional Syndrome Type II) to be exact. To learn more about Ramachandran’s work, click here. Laurie Santos, Comparative Psychologist, presented on irrationality, decision-making, and human error. Her presentation , The Evolution of Irrationality: What Monkeys Tell us about Being Human covered two topics, 1) Understanding the bad parts of being human and 2) irrationality. Now, it’s pretty difficult to monitor decision-making processes of humans but she wondered if Capuchin monkeys could develop their own system and technology of commerce. She was pleasantly surprised to learn the species knew more than she expected. One of the fascinating aspects of her research and presentation involved reminding the audience that even in the face of consequences, we STILL make errors. Personally, I think of looking into a fridge multiple times KNOWING very well nothing has changed and some slice of chocolate cake is not going to magically appear (yes, I have looked into a fridge multiple times) is irrational. I’ll be the first to admit it. It is human to repeat actions and gestures to see if there is a different result. Santos’s presentation reminded me of Gambler’s Fallacy. During her talk, she discussed how economic biases and systems of errors play a tremendous role on our ability to make decisions. Specifically, there are two biases humans grapple with, which are 1) Reference point bias: we think along the status quo and 2) loss aversion: which entails taking on more risk. She found monkeys, like humans, typically play it safe. Although decision-making is not necessarily what people may think of when asked the question, “What does it mean to be human?”, decision-making is integral to our development. We make decisions everyday of our lives – some minor (Blueberry muffin or oatmeal) to major (deciding to have major surgery and dealing with the odds and consequences of a life altering decision). Yet, it is our decisions, our choices, that dictate what happens. After listening to research around decision-making, philosopher, Thomas Metzinger, discussed the idea of being selfless or self representation. He started his talk by sharing two experiences: 1) when he started his doctoral program, he found many people did not believe in the idea of the soul and 2) Metzinger’s out-of-body-experience (OBE) after a meditation retreat. Personally, it’s great when people share personal experiences verus pontificating on some point based on their research! It was great because a lot of the intro meshed with the two philosophical concepts he presented. First, the Self-Model, which is the idea that an individual’s thoughts and emotions, phenomenologically entail some global form of consciousness. He referenced Spinoza’s idea that the Soul is the body that develops. The second concept was transparency. Essentially, transparency entails no access to the construction process. A person is not privy to how the soul’s construction because the body develops in tandem with the soul. Bottom line: Self-Model + Transparency = Selfhood. In the Q&A, Metzinger expressed wanting a refined culture of “effortless introspection” and non-judgement. Although I wholeheartedly believe in Metzinger’s idea, you would need a lot of people that actually care to know what introspection means. Well known, Neurobiologist, David Eagleman started off with a question about “How do we know everything that happens in the brain?” He brought up a neuroscience joke about the tennis serve that went a little something like this, “If you want to muck up a tennis game, ask your opponent to show you their tennis serve (basically, they can’t! It’s difficult to mimic exactly what action takes place). That particular example makes a lot of sense and is reminiscent of the times when someone has said, “Wow, great shot or nice lap around the rink (I’m referring to skating) and out of nowhere, I mess up royally on my next shot or fall from showboating! In essence, it is in our nature for over analysis to kick into warp speed and alter what comes naturally to us. I enjoyed Eagleman’s metaphor of the brain being similar to parliament or a governing body with a multitude of experiences and perspectives. If there is a conflict in your neurobiology, this effects decision-making yet it is difficult to truly know what is in someone’s brain, literally. When the brain changes so do you. He brought up famous cases in history (i.e., Phineas Gage, Charles Whitman, etc.) that all point to us being our biology! Another fascinating aspect of his presentation dealt with the legal assumptions we collectively take on. We either base our decisions off of being 1) practical reasoners or the belief that we are equipped with 2) brains that have equal capacity (which simply isn’t true). Eagleton asserts neuroscience suggests these are poor assumptions to take on!! His take-home message: Know Thyselves (meaning, get to know the multifaceted make up for your neurobiology, personality, and psychology). Need to get rid of the illusion that you can completely make the distinctions that are happening neurologically. Lastly, make yourself an avid practitioner of exercising in the “pre-frontal gym” to constantly develop. Posted in Culture Criticism, Observations, Theory and tagged as being human 2012, conciousness, human cognitive processes, neurobiology, neuroscience, self, social science. Wow what a mouthful, even in the title alone. As for your childhood days (I couldn’t resist this one): good things come out of strange packages! Talk about mouthfuls! Seriously, for ME to say how engaging through and through the lectures were would be an understatement. I don’t remember being THIS engaged in any lectures. Not one fraction of a moment bored me! In fact, I’m positive I’ve grown more brain synapses that I’m going back to those videos. The experience was that fruitful and mind-enhancing. Richie Davidson, Beau Lotto, and V.X. Ramachandan walk their walk, and talk their talk! I’m certain I’ve grown several synapses due to the weight and vibrancy of those subjects that they INTELLIGENTLY and COMPASSIONATELY delivered. Moreover, they could do the VEGAS CIRCUIT as stand-ups! William James, for one, who described a time in his life where he would sink into a depression and couldn’t explain it. Krishnamurti, another one I’m reminded of because of his simple and profound talks in question/answer format and empathetic engagement in dialogue. To say it blew my mind wouldn’t do it justice! (I’m not done yet. I haven’t even read what YOU wrote and I’m looking forward to it! Thanks for reminding me of psychology greatest hits selection of books. James and Chopra are definitely worth my time. I haven’t touched their texts since college. I need to look for Krishnamurti though. Thanks again for sharing. Laurie Santos’ illustrations, especially of Cappuchin primates for the case study, were so adorable. Regarding precursors and case study, the same behaviors and actions are manifest in my cats Vinnie and Fluffy, except they have less latitude because they have paws. I appreciate her bringing out those empirical studies; they substantiate things we commonly experience through observation by defining them. Thomas Metzinger. I have to return to his Transparency talk tomorrow so that I’ll have a better grasp. When he briefly spoke of the soul and Aristotle, it reminded me of Bertrand Russell, who most likely share the same observations himself being an atheist. When I was 17 I had a similar experience of astral or double-body experience. I told my friend about it and she thought it was scary. But it was not. I also believe it could be explained on a neuro-biological level. To echo the hand experiment but with regards to astral bodies, I took a black velvet cloth as background and brushed my fingers together to see the ‘aural’ stuff was not an illusion. I, too, had this unusal but euphoric experience during a deep meditation a few years ago. I’m saddened because I only had that experience once and it is so (very) difficult to re-capture my mental state and what I was or was not thinking about. All I remember was the sensation of feeling lifted outside of myself and it felt very light and free. In any case, Metzinger presented some heavy stuff because it was predominantly abstract and philosophical thinking. Of course, he ran a study very similar to the idea of Ramachandran’s Phantom Limb. In any case, I’m hoping to have a decent post in Part II. I’m so behind! I went back to Thomas Metzinger, and funny thing, I understood just about everything he was saying because he articulated his ideas and proofs of what he was saying to such precision that I believe I was able to grasp the gems. The reason why I said funny thing, is because I’m not strong on the abstract-thinking department, but I felt I was able to add the one + one equals two, or more. Again I say it’s because of his speaking ability. Moreover, I felt akindred spirit facilitating my view into that ‘window’ because of his ethereal body experiences. It’s as if he were bridging science and metaphysics through practical analysis. 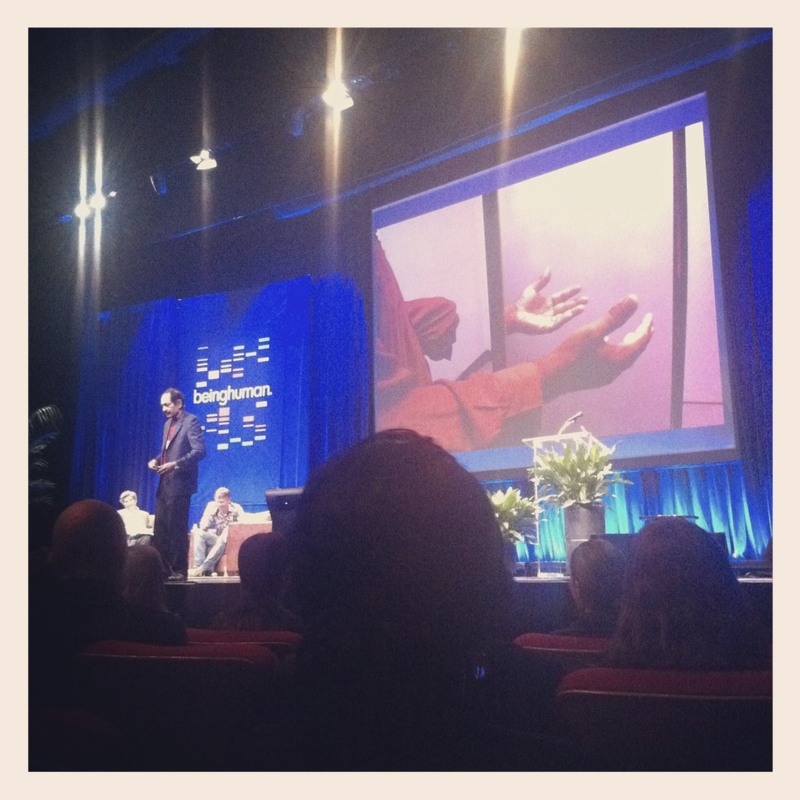 To say it was striking and revelatory, is a bland way of describing the philosophical content of his lecture. But if I were a professor, I’m pretty sure I’d do a good job of it. You’ve always been a philosopher in my eyes. You’re way more in touch with Metzinger’s thoughts on Selfhood and Transparency than I am and I actually studied philosophy. Ha ha! Thanks again for always being so engaged. You know what- I should have the dessert before the meal! READING YOUR WRITE-UP I MISSED SO MANY MEANINGFUL THINGS. I think that when you were paraphrasing one of Ms. Santos remarks, “It is human to repeat actions and gestures to see if there is a different result.” I think I understand and appreciate better how we cannot avoid the evolutionary process as a context of our decision-making. atment of their views; views that are a refined product of years of scientific research. Why? Because, for one, we have to take into account our meager attention-spans ( wonder Beau Lotto would respond to that on a neurological basis) and our biases. Their messages held some density. I missed the neuroscience joke about the tennis serve illustrating how difficult it is to mimic exactly what action takes place I missed Eagleton’s asserting through neuroscience two basic assumptions from which we base our decisions. Richie Davidson (did I spell it right?) wasn’t kidding when he said we are in for a real treat. A couple of things, non-judgemental is such a Buddhist concept. It’s totally swimming in the wrong direction and probably not so easy to do considering we constantly build constructs to help us function and be in the world and process at a faster rate. Probably another aspect of my post I need to re-edit. Eagleman brought up some neuroscience joke about the ‘tennis serve’, which can be applied to anything, really. Essentially, when someone asks you to perform an action, it’s almost always difficult to re-create and mimic that action because analysis kicks in. It’s no longer an action that stems from something instinctive and/or natural. Hopefully, this clears things up.